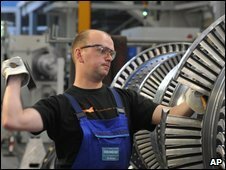 Industrial production in the 16 states that use the euro fell a record 21.6% in April, compared with the same month last year, according to Eurostat. It was worse than had been expected and followed March's figure of 19.3%. The month-on-month fall was 1.9%. The figures contrast with the latest UK production data, which showed a monthly rise for the first time in more than a year during April. Japan's production grew 5.9% in April compared with March's figure. "The April industrial production data for the eurozone are very disappointing and raise concern that the region is lagging in terms of signs of recession easing," said Howard Archer at IHS Global Insight. Industrial production accounts for about 17% of total output in the eurozone and the figures have raised concerns that its economy could shrink by more than had been expected in the second quarter of the year. The European Commission predicts that the eurozone economy will contract by 0.6% between April and June.